Sorry for the lack of a rant yestersay, I was out seeing "Jay and Silent Bob Strike Back" and I was not prepared ahead of time. But yeah, one year of RPG World! So many memories. Well, enough about the memories. Today's extra wacky comic-y thing is a parody of Electonic Gaming Monthly's news section. Being a big fan of EGM, this was a perfect idea for me. 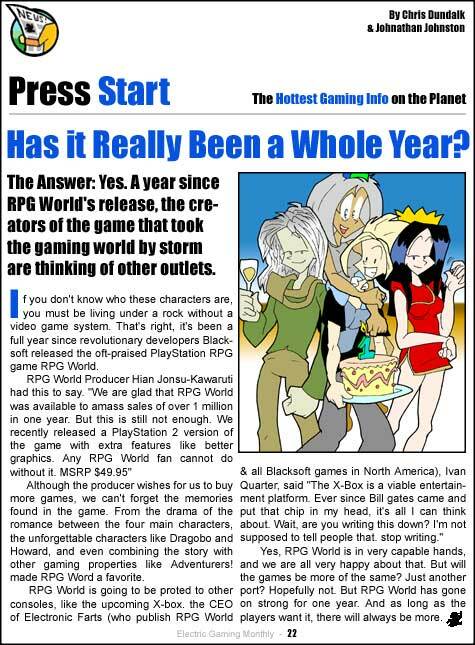 Fun Fact: back when RPG World started, I had mini "press releases" talking about RPG World the game and recent developments(that's where the Producer and CEO characters come from). ALSO- The Flower. Galgarion the flower was introduced in comic #113. He didn't "Come out of nowhere!" like so many people are seeming to think. The potion Galgarion took was to transform himself to make cherry like him. So far the only things Cherry likes are The Hero, the flower, sarcasm, and being alive. The only tangible one of those things that Galgarion could be is the flower. It's so simple when you think about it. I have just been informed that the tired, cliched, and awful Cartoon Network short "Kids Next Door" has been greenlighted for a series next fall. This saddens me. Cartoon Network shouldn't let kids vote for things. Kids are dumb. And I start school tomorrow! Aah!